We are super excited to host a guest teacher for this workshop! Lisa Shaub, of Lisa Shaub Fine Millinery, is known for her innovative millinery, creating her own hand made flowers and trims from fine fabrics and embellishing them with beading and hand painting. Her work is different from others, with a soft deconstructed look, using unusual color combinations and textures. In the workshop you will focus on sculpting flowers from silk and other fine fabrics to create a floral accessory that works for you. We will focus on how to choose the correct materials for a pleasing overall look, and how to construct your own beautiful trims from material to finished product. You will leave the workshop having created your hand made floral accessory. Wednesday, September 12th, 6-9pm. You can also book a private workshop or request a date. 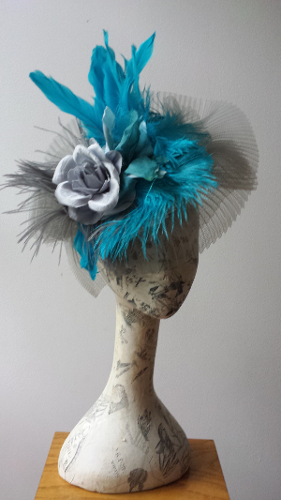 This workshop is led by Lisa Shaub of Lisa Shaub Fine Millinery. Lisa is known for her innovative hand made millinery, creating her own shapes, hand made flowers and trims from fine fabrics. Lisa has been creating original millinery for thirty years in New York City. She specializes in handmade hats and fascinators that have a natural, organic feel. Her celebrity clients include Beyonce, Megan Morgan, Taylor Swift, Brittany Spears and last year's Kentucky Derby winner, Mary Ellen Bonomo. Follow Lisa on Instagram @lisashaubfinemillinery.